» Bread - Why Sourdough? Bread will be bread, won’t it? Well, not quite. Bread is not a protected term which means that anything that somehow looks like one may be called bread. Undoubtedly this means that many a thing is sold as bread. Looking back into history bread was called the staff of life, which stands for a staple in the diet. A staff that holds up health, life and wellbeing. These days bread has got a pretty bad reputation for being full of carbohydrates which make you gain weight and don’t nourish the body. How come things have changed so dramatically? Well, they have changed indeed. The way bread is made has changed majorly and with wide reaching effects to its potential as a staff of life. Most bread available in our supermarkets is made using the Chorleywood Bread Process (CBP) which was invented to make the production of bread more profitable - make more in less time. Unfortunately this process uses relatively huge amounts of bakers yeast (Saccharomices cerivisiae), very little lactic, or probiotic, bacteria and it asks for additives, preservatives and emulsifiers to make the bread last longer without going stale and to keep it nice and soft for many, many days. These additions are not necessary in traditionally made bread. Another bonus Sourdough bread holds for all its followers is the natural reduction of phytic acid and phytates which occurs during the lengthy fermentation process. When introduced into our digestive system phytates team up with precious minerals like zinc, iron, magnesium and calcium and will drag them along on their way out of the body. This can lead to mineral deficiencies, even when mineral intake is sufficient. A lengthy Sourdough fermentation by lactic bacteria will cause the gluten to be broken into short chained amino acids, which are much more digestible and thus will not cause inflammation. Most people intolerant to gluten (and even some with coeliac disease) tolerate Sourdough breads very well. Sourdough bread has a lower glycaemic index than many other types of bread. It goes through a long fermentation and rising process in its production, and because of this and its lower pH, does not cause blood sugar to rise as dramatically as ordinary bread. A lot of research has been done to prove the nutritional benefits of Sourdough. Take a look at some more background reading. The case for rejecting or respecting the Staff of Life. The Chorleywood process and the rise of real bread. Study finds Sourdough bread has the most health benefits. What is Wrong with modern bread and grains? The importance of using fresh and wholesome grains and bread. Sourdough fermentation improves nutritional properties of starch. "Only when wheat gluten is properly fermented it is healthy for human consumption. When not it is potentially one of the most highly allergenic foods we eat." All seeds - and nuts, grains, beans are all seeds after all - were not designed to get digested by anyone who eats them. They would rather get swallowed, carried to another place and be deposited without having changed the slightest. This is mother natures way of making sure they multiply and spread far and wide. 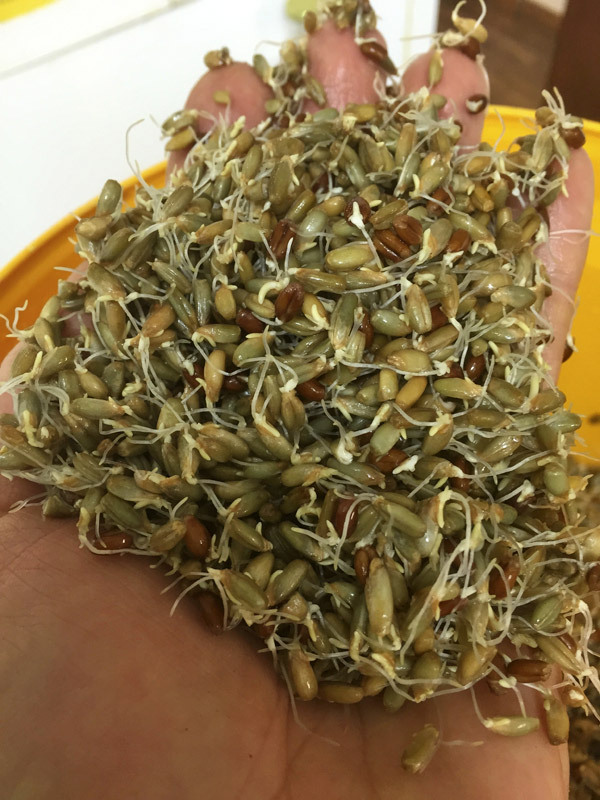 In order for the seed to let go of those properties that will save it from digestion it needs to ‘feel’ as if in a safe environment in which it will sprout and grow. Result: much higher nutrient availability for us.